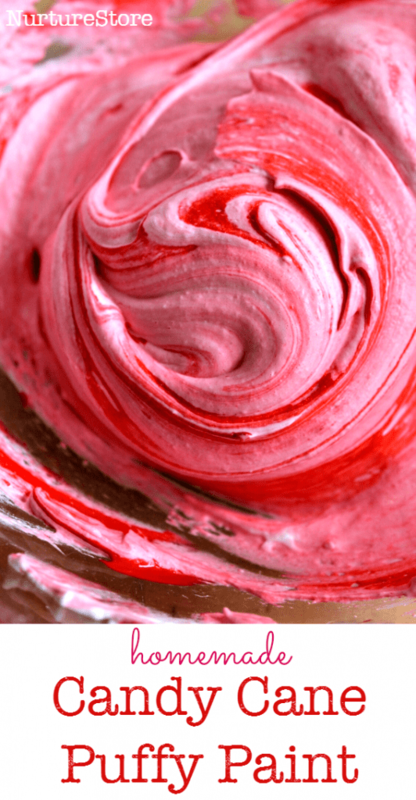 Marbling using shaving foam is such a wonderful process art activity for children. It’s a very simple technique and the results are unique with each print. 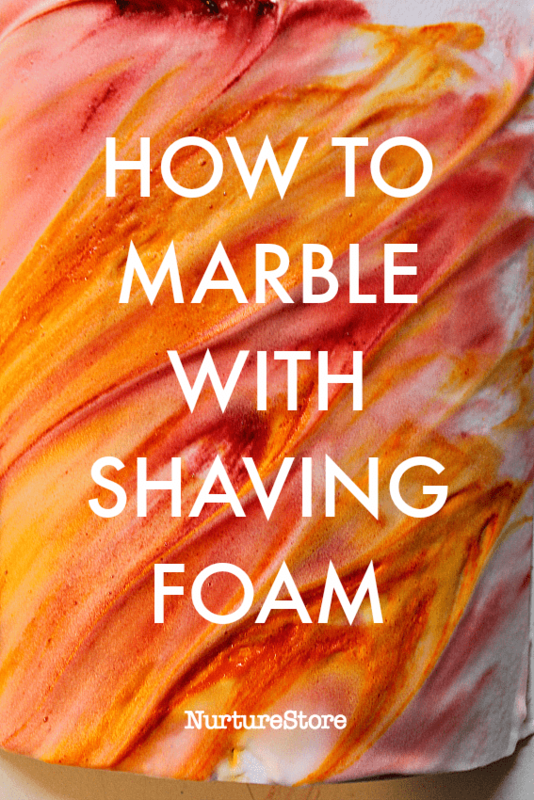 Read on to learn how to marble using shaving foam and give it a try! 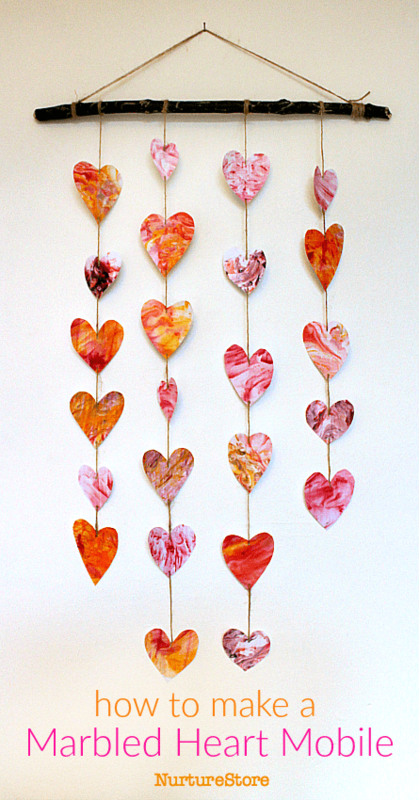 This homemade wall hanging is a simple Valentine craft that is easy to make, beautiful, and unique! Want to put the play back into learning? Finding ideas for sensory play while also needing to teach math and literacy can feel complicated. Do you feel like there’s too much pressure for early academics? Do you want to give your kids a childhood where they learn through play but you’re not sure how? Do you feel like your child is measured too early against unrealistic standards and you know they need more sensory input, more fun, and hands-on activities? Maybe you’re a parent who wants to get your child away from a screen and into active play. Or you have a special sensory child who needs their own sensory diet. Maybe you’re a childminder or a nanny who needs to balance activities for a range of ages, with a tiny budget for materials. Perhaps you’re a teacher who truly wants to have a play-based classroom, but you’re already stressed by the demands of observations and administration. Or perhaps you’re a therapist or specialist who needs ideas that colleagues and parents can use. I totally understand, because I’ve been there. Nobody wants to feel they’re not offering their child the best start in life, and you’re not – you just need the right tools…. 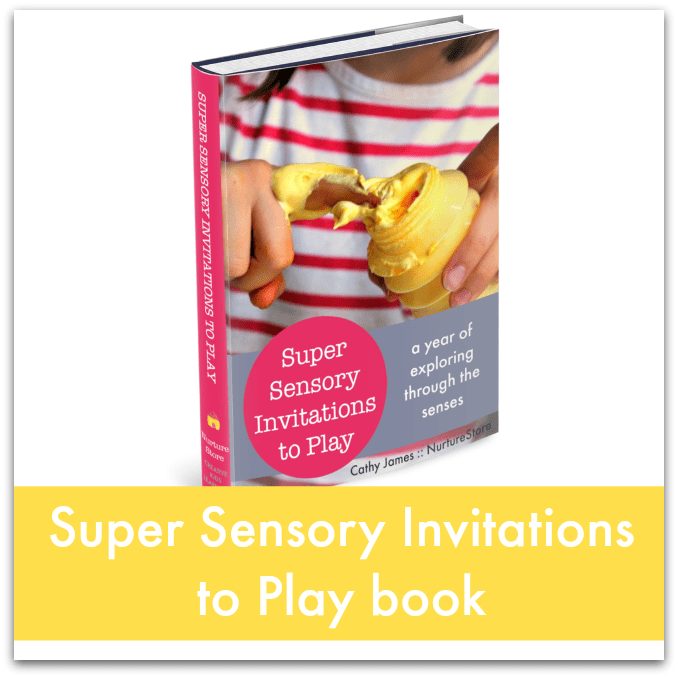 That’s why I’ve gathered together 52 super sensory invitations to play to help you transform your home and classroom into the funnest place to learn – all while helping your child develop strong math, literacy, and social skills as they learn through play. I’ve been supporting children in their learning for over 15 years and all the ideas in this Tool Kit have been tried, tested, and approved by real kids – so they really are the best ones! :: have the funnest home and classroom around! 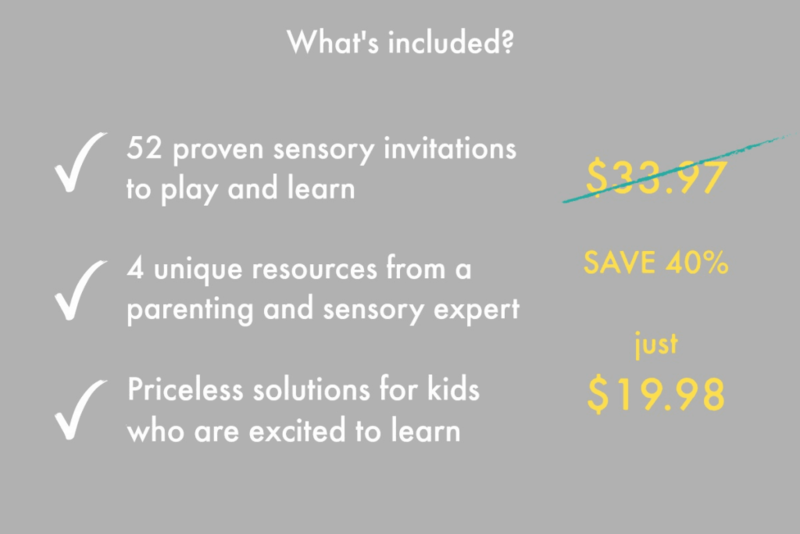 Transform your learning into a sensory-rich adventure with 52 invitations to play. 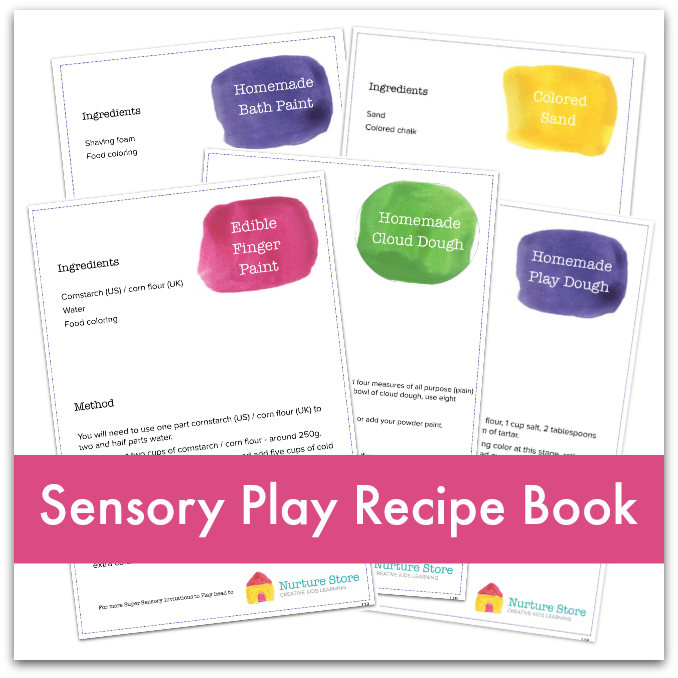 A year of themed sensory activities that sit perfectly alongside your lesson program. 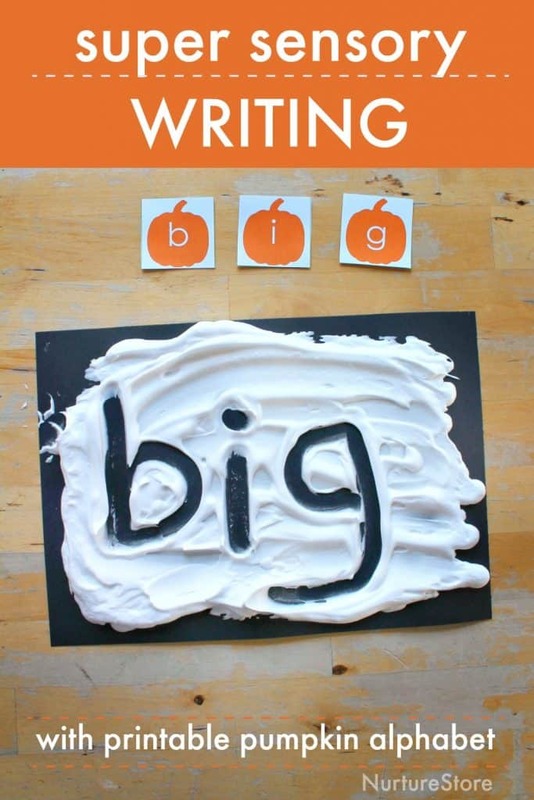 Hands-on activities that support and develop math, literacy, science, and social skills. A rich variety of sensory experiences to satisfy your sensory seeker and build the confidence of your sensory avoider. Engaging sensory centers that will have your children so excited to come and learn. Recipes and ideas for a whole year of play. Transform this childhood classic play material into a wonderful variety of rich play times. Easy activities that make learning fun – boosting fine motor skills to help your child get themselves dressed, fasten buttons, tie laces, and use a pencil with ease. 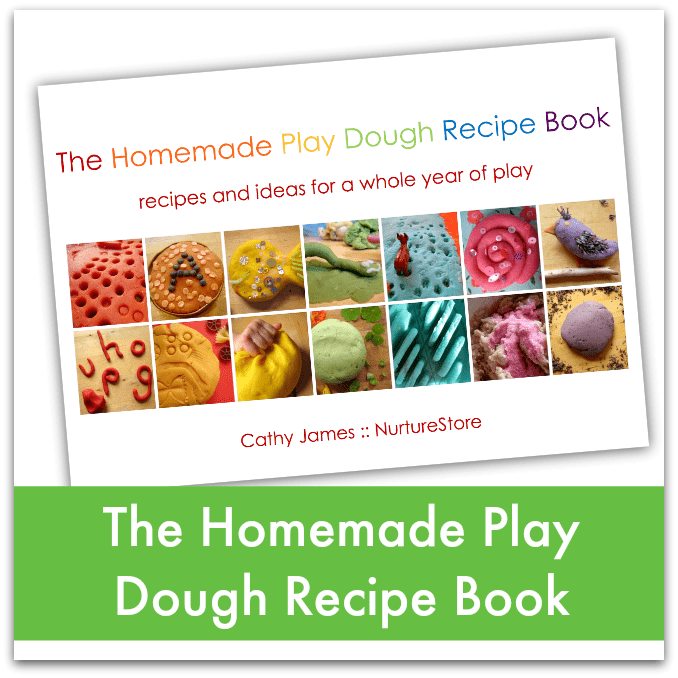 Affordable ideas that save you time and energy – matching quick and simple recipes with clever ideas so you don’t have to spend time gathering resources and creating all your own activities. 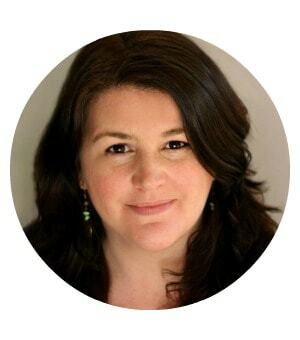 SENSORY AND NATURE ADVOCATE, OFSTED ‘OUTSTANDING’ EDUCATOR, ENGLISH LANGUAGE TEACHER, HOMESCHOOLING PARENT AND AUTHOR OF SUPER SENSORY INVITATIONS TO PLAY AND THE GARDEN CLASSROOM. CREATOR OF NURTURESTORE. Can you afford to let your kids miss out on play? You can give them the gift of delightful learning. Sometimes we just need a little help from someone who’s already been where we are and has figured out a solution to the challenges we’re facing. Grab the opportunity! You don’t have to compromise your kiddo’s childhood. You can combine play and learning. You don’t need to keep spending hours planning activities that fall flat. You don’t need to feel guilty about too much screen time. Ready to give your child the gift of learning through sensory play with the amazing Super Sensory Tool Kit? What exactly do I get in the Super Sensory Tool Kit? 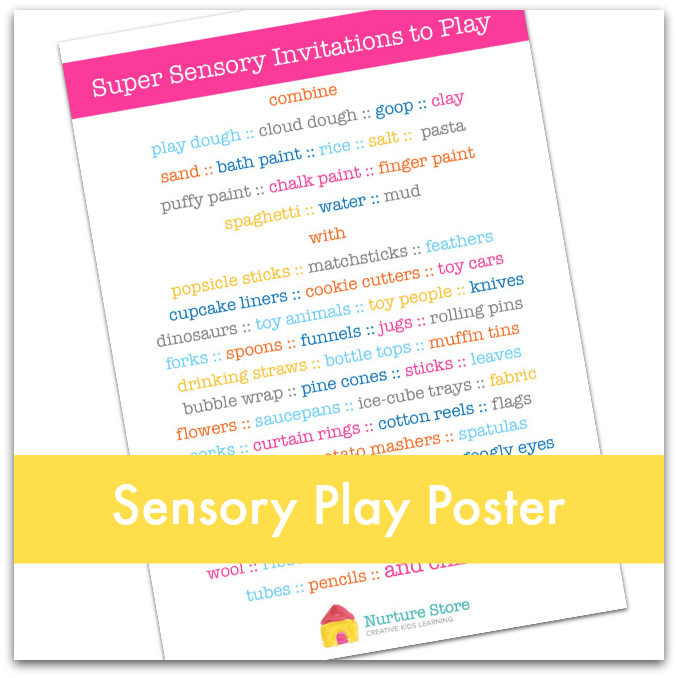 Plus a bonus Sensory Play Poster. Is the Tool Kit suitable for an experienced teacher? Definitely! We all need fresh ideas, as well as classic activities that can be used again and again. The Tool Kit will save you so much planning time, so you’re free to focus your expertise where you really want: engaging with your children. Even better, the Tool Kit has many ideas you can share with colleagues and parents so they can continue your good work. Who is Tool Kit meant for? Which ages? The Tool Kit is perfect for anyone raising or working with young children. 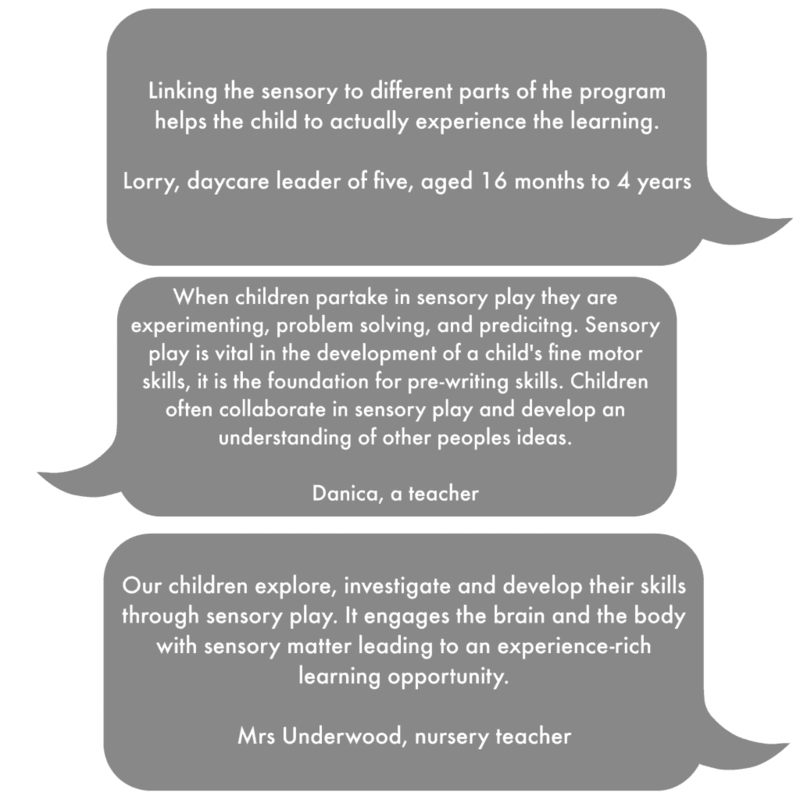 The beauty of sensory play is that it engages children exactly where they are in their needs and development, including babies, toddlers, preschoolers, elementary kids, and those with extra special needs. Whether you’re a parent looking for fun after-school and weekend activities, a special-needs mom or dad looking for a rich sensory-diet for your child, or a childminder, nanny, teacher or therapist who needs a variety of activities to reach children across ages and requirements, the Tool Kit has ideas you can put into practice today. How much is the postage? Can I buy it in my country? Great news! 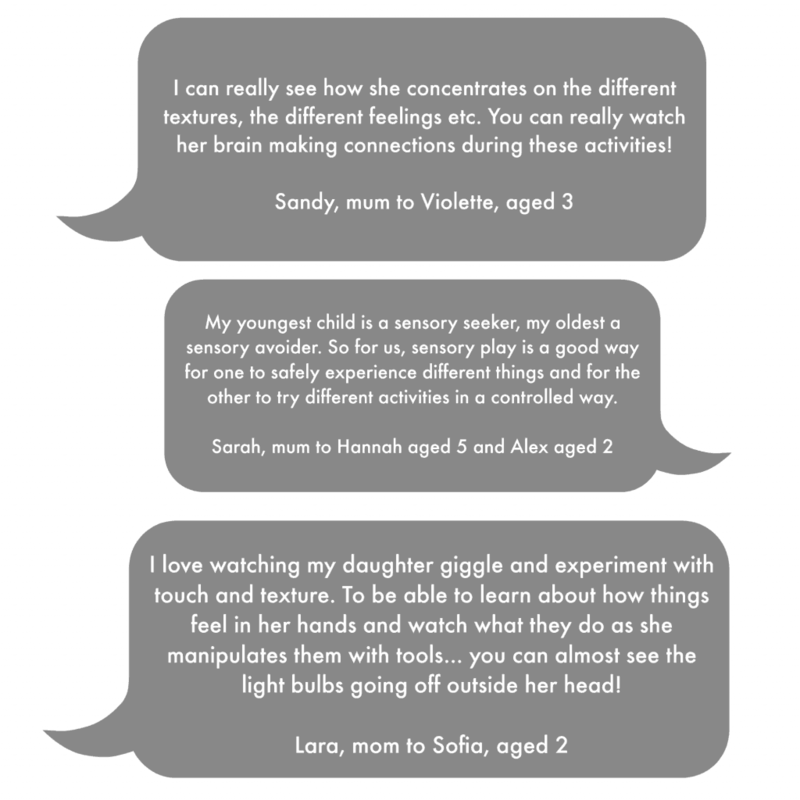 The Super Sensory Tool Kit is a digital product, which means you can get an instant download of the ebooks and resources. You can then decide if you want to read on your computer or mobile device, or print all of it or some of it. It gives you a flexible kit that you can take with you wherever you’re playing, teaching, and working. Please note that with the exception of the United Kingdom, this product is not available for purchase in the EU. Email us at [email protected] and we’ll be happy to help. 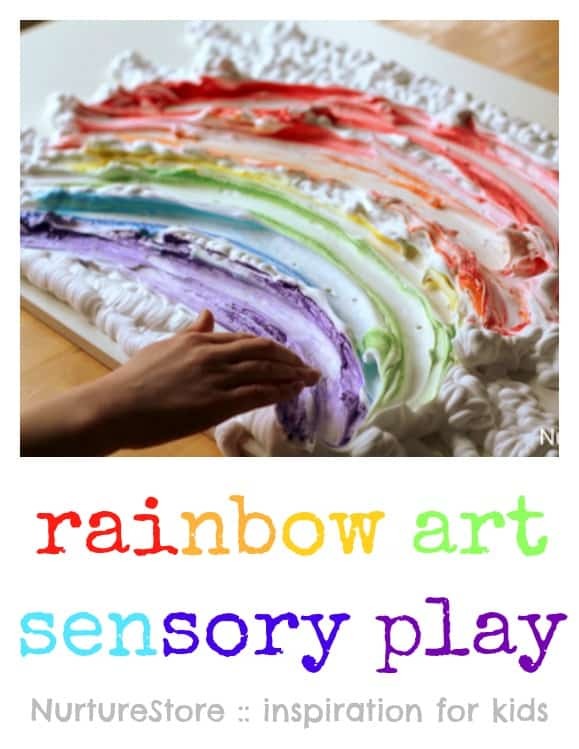 Combining messy play, colours and hands-on fun, this rainbow art shaving foam sensory play was a huge hit with my children. 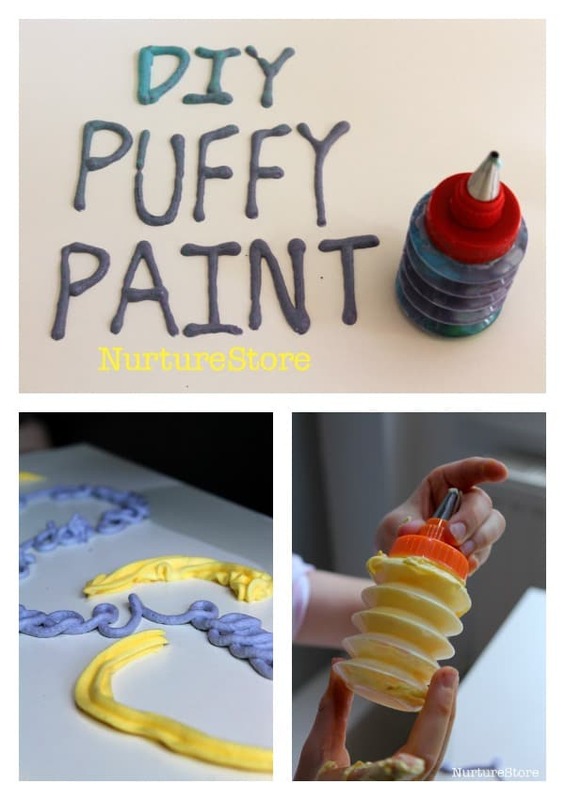 Here’s how to set it up, along with more ideas for rainbow play activities.